Once upon a time, I told my sister, “I don’t think I’d ever date an ENFP.” Even though I’d seen lots of people describing ENFP-INFJ as a “perfect” pairing it just didn’t sound like a good fit for me. I loved having ENFP friends, but the ones I knew were either so intense they made me feel anxious, or so extroverted they wore me out, or too scattered for me to think I wouldn’t eventually get irritated with them in a closer relationship (or all of the above). Then a few years after making this statement, I started actually getting to know one of my ENFP acquaintances. And now we’re dating (doesn’t that sound like just the sort of coincidence that would happen in a romance story?). He does have an intense personality but I’ve done enough work overcoming my social anxiety that doesn’t scare me any more (actually, it’s rather exciting). He’s the most extroverted person I know but I’ve discovered it’s not a problem for us. And he’s not scattered or flaky (which, it turns out, is another of those unfair/too widely applied stereotypes bouncing around Myers-Briggs circles). Now, I could spend the next 1,000+ words telling you about how wonderful my boyfriend is but that’s probably not what you clicked on this post for (if it was I’m afraid you’re going to be disappointed). Instead, we’re going to talk about why ENFPs and INFJs have a reputation in Myers-Briggs circles for getting along so well. It’s not readily apparent from just looking at the letters, but ENFP and INFJ types have minds that work in very similar ways. Though the types only share two letters, when you break down the function stacks you see they’re perfect mirror-images of each other. ENFPs and INFJs both lead with Intuition as their dominant and best-developed learning function. They both have Feeling as the co-pilot process they used to make decisions. Thinking is their tertiary function, which is less well developed but still accessible. And Sensing is their inferior function, which they have poor access to and which often shows up under stress. But they use different forms of each function. Extroverted intuition is very much about exploring the outer world and putting the pieces together. In contrast, introverted intuition processes observations internally. Both functions care about finding patterns and coming to a deeper understanding, but Ne experiments while Ni ruminates. And they communicate with each other in a way that naturally “clicks” with how the other type frames the world. Intuitives only make up about 30% of the population and dominant N types (ENFP, ENTP, INFJ, and INTJ) are an even smaller percentage, so finding someone to connect with in this way is rare and exciting. And INFJ’s feeling side is focused outward — they make decisions based primarily on how it will affect other people with a focus on maintaining harmony. An ENFP’s feeling is introverted — they check to see if a decision lines up with their core values with a focus on being authentic. This is the co-pilot process for both types, which means it’s the mental process that is second-most developed and that it’s essential for personal growth. FP types generally have their own emotions figured out while FJ types are more in-tune with other people’s feelings. They can balance each other out quite well while also helping each other grow. Exactly what role the tertiary function plays is up for debate. Some teach it doesn’t really develop until you’re in your 30s, while others say we can “skip” developing our co-pilot and end up with a fairly strong tertiary side (partly because it’s extroverted/introverted the same way as our dominant process, so it feels more comfortable). So even though it’s not as readily accessible to ENFPs and INFJs as N or F, their T sides can show up quite a bit depending on the individual person. When it does, it’s turned inward for INFJs (with a focus on finding and using accurate information) and outward for ENFPs (with a focus on arriving at efficient, logical solutions). Put the two types together and they become a surprisingly efficient problem-solving duo (though they’ll also be creative, off-the-wall, and unconventional). The Sensing side for both types is poorly developed. We can work on becoming more comfortable with our inferior functions, but we’ll never use them as effectively as the ones higher on the function stack. Plus, they’re also what tends to come out when we’re under stress. A stressed INFJ’s inferior Se tends to see the outer world as threatening and may overindulge in sensory things like eating and watching TV. An ENFP’s inferior Si, on the other hand, tends more toward withdrawal and worry. Both types can also demonstrate obsessive behavior and preoccupation with physical sensations (in contrast with dominant Sensing types, who are very comfortable with sensory information). Having similar inferior functions can cause struggles for INFJs and ENFPs (e.g. they might both find that keeping track of practical thing like money is a challenge), but at least you’re not living with someone who finds one of your favorite ways of viewing the world stressful. We can talk function stack theory all we want, but it only gives a glimpse of what interactions between ENFPs and INFJs can actually be like. While I can’t speak for every ENFP-INFJ relationship (since even people who share a personality type can be very different due to background, culture, etc), I can share a few examples/insights with you. Once they get into an actual conversation it doesn’t take an INFJ and ENFP long to realize they could easily talk for hours. The first real conversation I had with my now boyfriend lasted over 3 hours while we and two or three other people (some drifted in and out of the conversation) talked about nerdy things. And since we’ve started dating it’s not all that unusual for a phone conversation to last 3 to 5 hours (yes, I actually talk on the phone now). They can spend enormous amounts of time with each other without the introverted INFJ getting worn out from socializing or the extroverted ENFP becoming distracted by other people. The ENFP draws the INFJ out of their shell in a way the INFJ is okay with and the INFJ gives the ENFP one person who’s interesting enough to hold their attention (at least for a while). Both INFJs and ENFPs often feel misunderstood. It’s easier to see with the more reserved INFJs, but the gregarious ENFPs are just as reluctant to share the core parts of who they are with other people. As a relationship develops between two people of these types, there’s a good chance they’ll both feel they’ve finally found someone who might actually understand them. INFJs can be are random, spontaneous, off-color, and quick-witted. But mostly in their heads. ENFPs are all those things in the outside world and being around them helps the INFJs start sharing their inside world with the outside world (which then gives the ENFP a partner who’s similar, but not too similar, in how they approach life). ENFPs have a reputation for being scattered, flirtatious, impractical, overly enthusiastic, and rule-breaking. And while many can be like that, those are superficial traits that point to deeper things like a zeal for life, a desire to learn and explore, and a genuine love of people. An INFJ is one of the types most likely to truly understand why an ENFP acts the way they do and then accept (and love) them for who they are. INFJs have reputations for being hard to communicate with, distant, and passive in relationships. Also, we’re often scared to let people in because we just “know” they’re not going to understand us and we’ll get rejected again. But once an ENFP decides they’re interested in you they’re not readily scared off by deeper revelations about an INFJ’s inner world. In fact, they’re one of the types most likely to be persistent enough that they’ll actually get to know an INFJ. As a strong intuitive type, I typically find it easiest to communicate with other intuitives but I also need to talk with someone who sees things a little different than me so the idea gets refined rather than just moved around in circles. 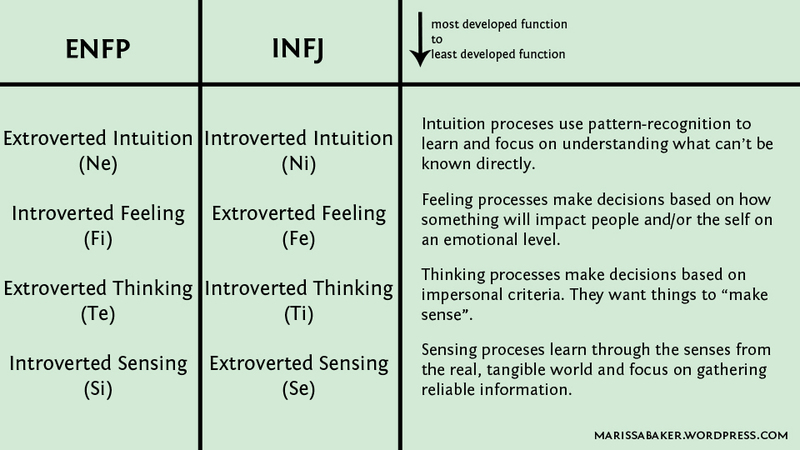 Since INFJs and ENFPs both use intuition but in different ways, they often end up refining and developing each others’ ideas. That can show up as everything from finishing each other’s jokes to finally clarifying what their exact views are on how culture influences what’s seen as appropriate levels of PDA. Neither INFJs nor ENFPs enjoy conflict. So when they do disagree on something they’re both passionate about the discussion will rarely turn into a full-blown fight. But it will get emotionally intense as the two idealist types go back and forth on opposing viewpoints. Update 5/28/2018 — My ENFP boyfriend and I broke up about 3 months ago. I’m updating this post with a couple additional points touching on the ways INFJs and ENFPs can experience stress in their relationship. The different functions that ENFPs and INFJs use to make decisions and process their feelings can make communication difficult. In fact, I’d say Fi-Fe conflicts were one of the biggest struggles in mine and my ex-boyfriend’s relationship. INFJs might initially be attracted to the fact that ENFPs don’t seem to care about what other people think, but after a while they can resent the ENFP prioritizing their own authenticity over maintaining harmony (to use Personality Hacker’s nicknames for those two functions). ENFPs don’t like being stifled, though, so they keep pushing. And that makes the INFJ feel unsafe, which is something we just can’t deal with in close relationships. 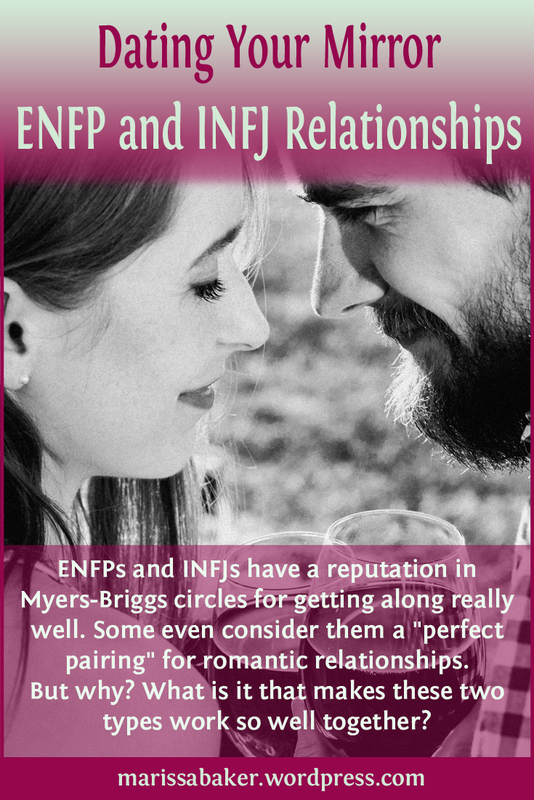 If you’re in an INFJ-ENFP relationship, you’ll need to find a way to navigate this dynamic so the ENFP can be authentic and the INFJ doesn’t feel threatened. The flip-side of that Fi-Fe complaint is that ENFPs might not feel like they can trust the INFJ is really sharing their authentic self. They’ve seen the INFJ play chameleon too many times not to question whether they’re being real with the ENFP. The INFJ needs to understand that when an ENFP double and triple-checks an INFJ’s answer to something it’s because they want to make sure you’re being authentic, not because they don’t believe you. But the ENFP also needs to understand that maintaining harmony is authentic for the INFJ. 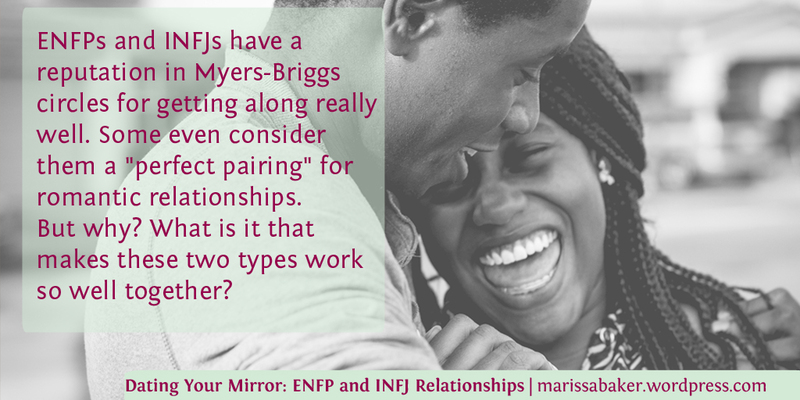 Even though who you should date is one thing Myers-Briggs can’t tell you, there are some types that seem to get along particularly well together. And not just in dating — people with your mirror type often make great friends as well. So what are your thoughts on this my lovely blog readers? Do you have any experience with or tips for ENFP-INFJ relationships (or other mirrored-type pairings)? Want to build an amazing life with a special someone? Check out Personality Hacker’s “Personalities in Dating & Attraction” program. Please note that this is an affiliate link. This means that, at no additional cost to you, I will receive a commission if you click on the link and make a purchase. ← Are We Living A Performance Or Living For God? Very interesting, thanks for sharing. I’m an INFJ and I had heard before about INFJs ans ENFPs getting well along, but this is the first time I read it in more detail… I wish I knew all of my friend’s and acquaintances’ type, but here in South America it’s not common to know about the MBTI. I’ve made some of my close friends take the test, but none of them is an ENFP haha. As an INFJ I guess I’m not sure what anyone else that I’ve dated has been?? I’m glad that this works out for you guys and it’s really interesting to read the balancing…it gives me anxiety just thinking about it though, lol! There is so much to learn about psyhology. I feel like i should have study it, but i chose fine arts and design instead. There is where articles like yours come in handy. Thank you for satisfying our couriosity. Very interesting. My best friend outside of my spouse is an INFJ. I’m an ENFP but I feel that time and age has turned me into an xNFP. Great work on this post. Will it be a chapter in a book on type theory? I have close friends of intj and infj type. I’m an Entp. All in all I’d say the connection with intj is a little lower stakes; there is less forward propulsion and it feels less dangerous and more comfortable. I think it’s a bit like you described actually. I’ll say it’s one of the most meaningful friendships I’ve had. It’s just also kind of easy. With the infj my experience is different. Because we have swapped Judging functions on the Fe/Ti Axis, we are able to push each other out of dominant/tertiary loops more readily. So the friendship is higher stakes and more intense with like, an element of “work” and improvement of self in it. It’s like, really freaking hard. But the communication is of a style that feels vaguely familiar and like family. Feels like a sibling in an intense and sweet way, someone I can easily fight with and move forward with even if the fight is heated. I’d say the infj and Entp can get their claws in each other because they are communicating on the Fe/Ti Axis together in a way that the intj/Entp mirror you describe prevents. that makes the mirror relation kinda lower stakes for me than the infj/Entp one where it feels like she’s got options for healing/destroying me lol. The coolest part of the infj/Entp relationship, besides the Ne/Ni interplay you described, is how every time infj used extroverted feeling at the Entp, Entp loves and appreciates it and says so, which drives a feedback loop; every time Entp stays in introverted thinking, infj sees it and notes it and enjoys that skill too. The Pair will I think find it easy to know how to love/destroy each other. Intj/Entp just simply less high stakes. Still super impactful for me though. I’m an INFJ and I’ve been dating an ENFP for about three months. All we seem to be able to do is argue and discover new problems in our relationship. Whenever she has a problem with something I have said or done, rather than talking to me about it and finding out if her assumptions as to my reasons behind my actions are accurate, she chooses to talk crap about me behind my back not even knowing that she’s completely wrong, causing me to question whether or not I can trust her emotionally. That sounds awful 😦 I’m sorry your INFJ/ENFP relationship isn’t working out. Sounds like it’s probably an issue outside personality type, though — it’s not a good sign when someone of any type talks about their partner behind their back instead of actually addressing issues in the relationship. I’m an enfp and my partner is an intj/infj. We are very much into each other. I was the quintessential stereotype of enfp flitting from relationship to relationship. But since I’ve found him, nobody else even comes close to comparing. He’s gorgeous and kind and clever and ambitious. I read this blog post and everything you’ve said rings true. You two sound adorable 🙂 I love your neon green grass comment! Oh my gosh… this is so accurate for me and someone I love. He says some part of him keeps pulling him back, but a part of him wants me. We haven’t used the word love yet, cause he isn’t ready for it, but i know he has feelings for me too. We just jell so well. I’m an ENFP by the way, and he an INFJ. I can relate to this so much, we talk for hours on the phone. Thanks for sharing this information. I loved it! I am sorry your relationship ended, that is never fun. I dated an INFJ for just under two years ( ENFP) here. It was my happiest relationship, I mourn it deeply. I wanted to marry my INFJ. We are both gay women and I think(know) my INFJ struggled with coming out and was deeply fearful of not wanting to disappoint her family/friends she had a very religious circle. We are late 20’s early 30s so this is a looong struggle with her. I am pretty sure this is the main cause for our breakup. But, I also think this pairing has to work extra hard at actually communicating we both use intuition so heavily I think it’s easy to have misunderstandings. To all, you other INFJ/ENFP relationships use your words, and talk, talk about the worlds of dreams/expectations don’t lay down hints and expect your partner to intuit them. I have a best friend that is an INFJ and I am an ENFP. This was an amazing read. I enjoyed it! It was very accurate! I am INFJ and my husband is ENFP. I used to wish I could spend a month on a island by myself. Now I wish I could spend a month on an island with only my husband! We have been married over 30 years…I guess the connection between the two types works for us! That’s adorable ❤ I'm so happy you have such a good marriage! But my boyfriend undestood soon enough that those “deep talks” of mine about our cores are for our, and general, well-being and of couse, authenticity (souns more like INFP but I’ve checked that like trillion times). Now it’s time for me to deeply understand his intentions and motives. Thanks a lot for the article! You’re welcome 🙂 I’m glad to hear you’re both working on communication and understanding each other. That’s such an important part of any relationship. Great article indeed. I am an INFJ guy. I don’t really have an ENFP date but I do have a few ENFP friends. The conversation thing is very accurate. We talked for more than 8 hours on one occasion and the other occasions last for at least 2-3 hours. I did think about dating an ENFP girl(none that I know of) but the issues highlighted here seem to be points that should be given more attention to. Thank you very much for sharing your input(s). I am rather sorry for the breakup. I do hope you find someone who makes you grow even further as a person. Good luck in everything that you pursue!